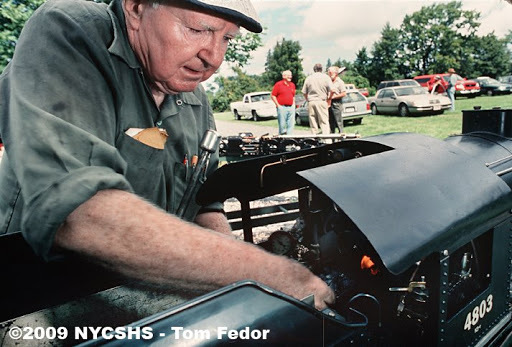 In July 2000, Tom Fedor of Thurmont, Maryland, visited the Finger Lakes Live Steamers in upstate Clyde, New York. 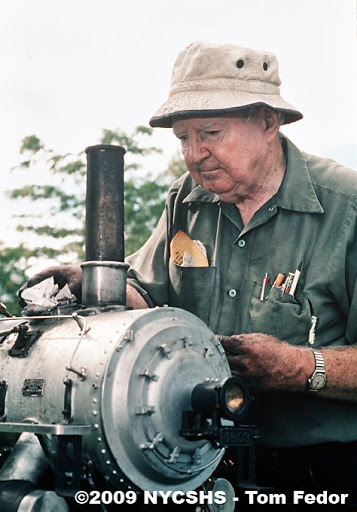 He had the chance to meet Harold Crouch while he was busy steaming up his model of a New York Central K-3r Pacific. Harold enjoyed a 34-year career with the NYC, Penn Central, and Conrail, so he knew a thing or two about trains. “I wish I had a good story about Harold to share,” Tom says, “Unfortunately, I only met him this one day the photographs were taken. 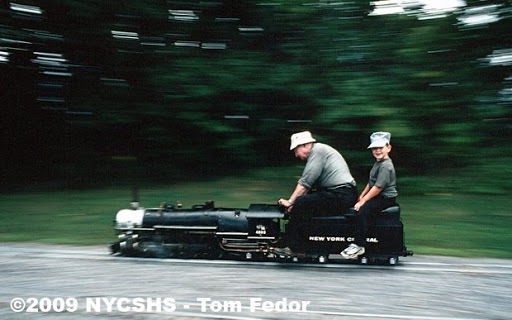 He willingly gave his time to me, this complete stranger who hovered over his shoulder as he steamed up his locomotive.” Tom was shooting slides this day, and took mutliple exposures as Harold worked. “I can’t imaging how may shots I bracketed and flashes that were popped. Never once did he tire of my presence. I remember him as being very generous with his time. I’m grateful to him for letting me document his passion that day.” What follows are some of Tom’s photos from that day in 2000. Harold Crouch lived in nearby Newark, New York. 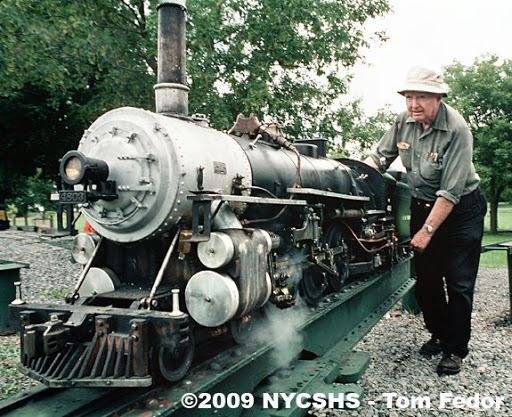 Here he is seen getting his NYC Pacific ready to steam up at the Finger Lakes Live Steamers in July 2000. 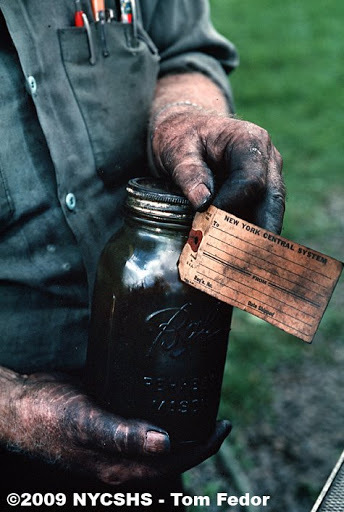 Crouch holding a Ball jar of genuine NYC steam cylinder oil he uses on his live steamer. Only fitting that a model NYC Pacific get real NYC oil! The Pacific at speed! Seven year old David Randolph of Ohio is riding behind Crouch. 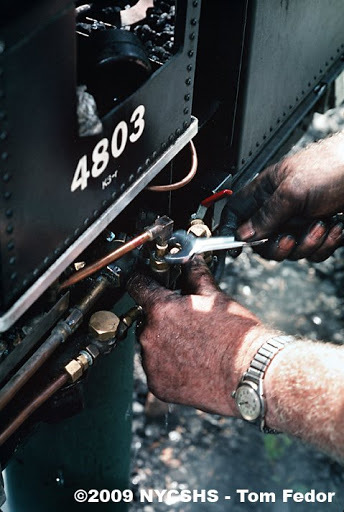 According to information posted on the Finger Lakes Live Steamers web site, the funeral-mass service will be this Saturday, April4, 2009 at 10:00am at Holy Cross Church; 4492 Lake Ave, Rochester, NY 14612.